Sometimes we aren’t able to log into instant messenger when we aren’t online, or maybe we are out of town, or maybe busy. In such circumstances there might be people who want to contact you urgently but unfortunately they aren’t able to do so. So, in such a case how do they contact you? Well, leaving an offline message would do the job. Offline messages? How’s that possible? Answer IM is an online service which helps you to solve this problem with ease. 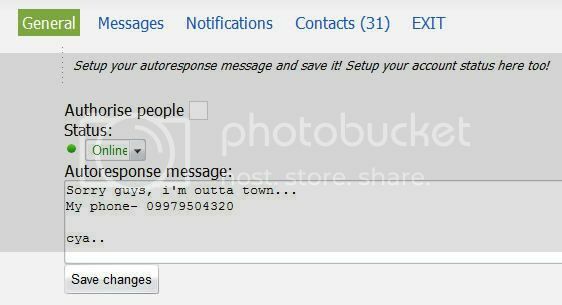 Using this service you send an automatic predefined message when you aren’t signed into the instant messenger or you’re away from Internet. The message may be in the form of a link, text or even a phone number. This service is currently applicable to Gtalk, Yahoo, AIM, MSN and ICQ. How to use Answer IM? All you need to do is head over to answer.im and log into your IM account (Gtalk, Yahoo, AIM, MSN orICQ). Once you’re logged in you need to setup your online status, automatic answer text and notifications. Lastly, you can now close the webpage; your account will stay online and automatically answer with your text. This service is pretty cool but there’s a small drawback, you can’t use this service for mroe than a day as the servers are heavily loaded.